Regarding the date of Sri Krishna, there is no doubt difference of opinion amongst historians who have been largely inspired and influenced by oriental scholars and their Indian followers. But if an unprejudiced study of the Puranas, Srimad Bhagavata and other records of Indian origin is made, interesting details regarding Krishna’s birth date and time come to light. We may easily dismiss the findings of some of the modern scholars that Mahabharata took place near about 2000 B.C., that Bhagavadgita was composed in 1000 B. C. and that Krishna was a mythical person, based as such findings are on untrustworthy and one sided data and because of the fact that the great historical documents, viz., the Puranas are completely ignored. Bhagavata, we can also glean (Skanda 11, Chapter VI) that Krishna lived for 125 years, Vishnupurana (Amsa 5, Chapter 37) corroborates the same in suggesting that Krishna lived for 125 years. If we again refer to Bhagavata (Skanda 11, Chapter 7) and understand the 2nd sloka clearly we can find that Kali entered (i.e. Kaliyuga began) immediately after Krishna shuffled off his mortal coil. That Kali entered on the day Krishna passed away and that Krishna was born in Yaduvamsa at the end of the Dwaparayuga of the 28th Mahayuga, *’. e., the Dwapara preceding the current Kaliyuga, becomes evident by a perusal of Vishnupurana (4th and 20th Chapters and V Amsa, 23rd Chapter). 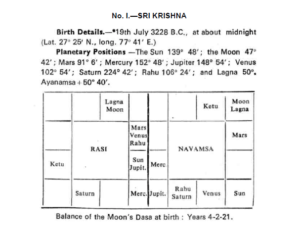 Thus by placing together details taken from the most important historical and cultuial documents of ancient India, viz., Srimad Bhagavata, Vishnupurana and Harivamsa, it may be clearly inferred that Sri Krishna was born at midnight, on the 8th lunar day of the cyclic year Srimukha, in the 126th year counted backwards from the date of commencement of Kaliyuga on 18-2-3102 B.C. corresponding to the 1st day of the lunar month Chaitra of the cyclic year Pramadhi. This corresponds to the midnight of 19th (20th) July 3228 B.C., and the above horoscope is cast for this date. In his Royal Horoscopes, Prof. B. Suryanarain Rao, by a careful study of the Bhagavata records, mentions that Krishna was born “in the Dwaparayuga after the lapse of 863874 years, 4 months and 22 days in the cyclic year Srimukha, on the 8ih day of the dark half of the lunar month of Sravana, when the constellation Rohini ruled, at about midnight”. Prof. Rao’s findings may be considered as correct. 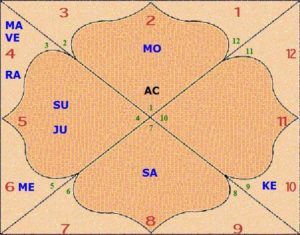 But the Chart or Kundali he gives showing Saturn in Aquarius, Jupiter and Mercury in Virgo, the Sun and Venus in Leo, the Moon and Lagna in Taurus, Mars in Scorpio and Rahu in Libra does not fit in with the birth data. Mr. Cyril Fagan, to whom I am much indebted for the immense trouble he has taken to calculate some of these ancient horoscopes, informs me that by making a thorough astronomical search from 4000 B.C. to 2000 B.C., i.e., for 2,000 years on either side of the traditional date of Kaliyuga he has been able to find that the position of the Sun, Jupiter and Saturn in Leo, Virgo and Aquarius respectively and Rahu in Libra could occur only in 3251 B.C., in which case, Krishna’s birth should have occurred on 4-7-3251 B.C., and His death in February 3125 B C„ i.e., exactly 23 years before the beginning of Kaliyuga. 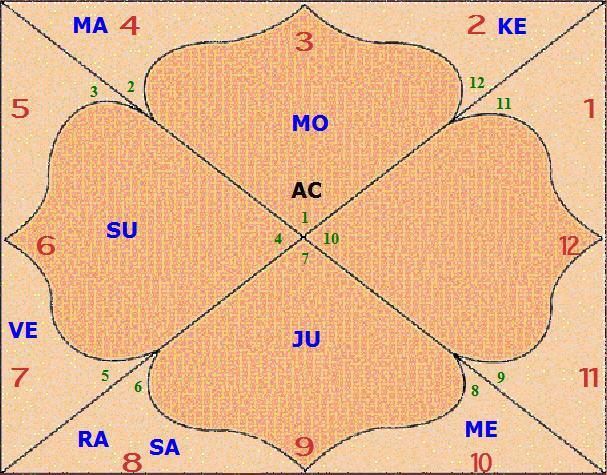 These “justify” to some extent that Kaliyuga began “shortly after Krishna’s death.” On 4-7-3251 B C, the positions of all the planets will be as per the Kundali given by Prof. B. S. Rao, but Mercury will be in Leo and Mars in Aries. The term “shortly after” death, used by Prof. B. S. Rao, may mean a couple of days or a couple of months or even a couple of years after Krishna’s death. But according to Matsya Purana (vide Adhyaya 271, slokas 51-52) the matter becomes quite clear when it says that the year and day on which Krishna passed away mark the commencement of Kaliyuga. Without straining these authoritative quotations, we may safely assume that on the (traditional) day of Krishna’s death, Kaliyuga commenced and that Krishna was born in the 126th year counted backwards from 3102 B.C. 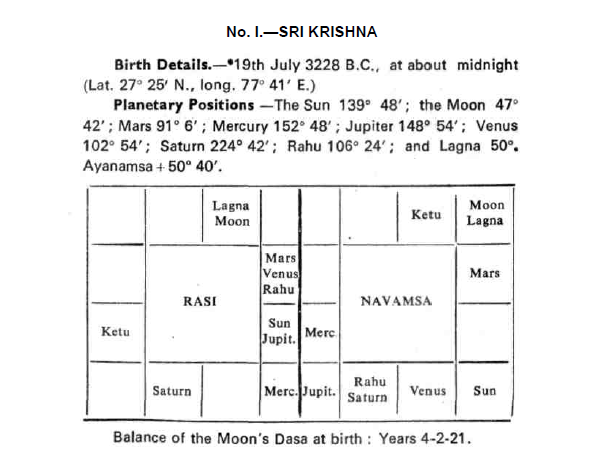 It occurs to me that the Kundali given by Prof. Rao was not probably verified as otherwise, he would have taken care to see that there was no inconsistency between the planetary positions and birth details. Special Features —The Lagna is Taurus or Vrishabha, a sign of Venus, and it is occupied by the Moon and aspected by Saturn making Sri Krishna extremely handsome. The dominance of the influences of the Moon and Venus, with Saturn and Mars, made the Lord’s appearance, wonderfully graceful. From classical texts we gather that Sri Krishna possessed a magnetic personality, crimson cheeks, ‘coral lips’, a fascinating face and a sky-blue complexion—features largely due to the delicate blending of the martian, saturnine, venusian and lunar features. Lagna lord Venus is in his own navamsa. Consequently, Krishna was a master of courtesy even to the “lowborn Chandalas”, as the Bhagavata refers. His invincible prowess in the field of battle is brought out by the neecha-bhanga of the martial planet Mars in the 3rd or house of courage. It must be noted that he defeated mighty Sisupala and other kings and formidable foes by dint of courage, tact and resourcefulness. The Moon, the planet of emotion, is exalted in Lagna, and unafflicted by Rahu conferring great serenity of mind, while Mercury the planet of intellect who owns the 2nd or house of speech is exalted in the 5th or house of intelligence. This is a unique combination denoting wonderful intelligence and extraordinary conversational ability. His was a giant intellect unequalled in analytic understanding. He passed through the virtues and deceptions of the thoughts of His day. He was superior to any thinker of His times. Krishna possessed an uncanny diplomacy and unbounded vision and this should be attributed to the ideal disposition of Mercury. Jupiter is in the 4th. Sri Krishna was a man of rich and responsive human sympathy but the Sun’s association in his own place rendered Krishna a terror to the wicked and a friend to the wise. The 10th lord aspects the Lagna, the Atmakaraka Sun and the planet of Dharma Jupiter, in their turn aspect the 10th. Consequently He possessed a passionate zeal to safeguard Dharma. Krishna’s birth in prison is justified by the association of the lords of Lagna (Venus) and the 12th (Mars) with Rahu. 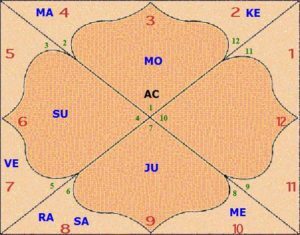 Jupiter, lord of the 11th (elder brothers and sisters), has gained 8 navamsas and is in the 9th. He is aspected by Saturn in Rasi and has joined Rahu in navamsa. It must be noted that Krishna was the 8th issue, all the eider ones having been put to death by Kamsa. Due to the exaltation of Matrukaraka Moon and the situation of Pitrukaraka Sun in his own house with Jupiter, his parents were long-lived. Both Kalatrakaraka Venus and the 7th lord Mars together, with Rahu, explain the fact that Krishna had a number of wives. But as Venus is near Rahu and away from the sensual planet Mars. His love for His wives had no taint of carnality as He was free from attachment of any kind. Though “associated with Prakriti, He was never affected by its qualities”. Birth in a sign of Venus no doubt endowed him with a vital nature but it was under conscious control. Mercury, exalted in the 5th or house of children, occupies the constellation of the Sun while Jupiter Putrakaraka is in association with the Sun, with the result He had innumerable children born to Him. The 4th or house of education is considerably fortified due to the presence of Jupiter and the Sun-Jupiter occupying the constellation of Venus. It is said that Krishna became an expert in “siksha, kalpas, vedangas and all the vedas, and also in archery mimamsa, logical and six expedients of politics” and that “within 64 days and nights” He became “an expert in sixty-four forms of learning”. Important Events — The Moon, though excellently placed, owns the 3rd while Mars, as ruling the 7th, is a definite maraka. Consequently practically throughout the Dasas of the Moon and Mars, which extended till the native was aged about 11 years, Krishna suffered from severe strokes of Balarishta in the sense that He faced many a crisis in His life, especially from those deputed by Kamsa to slay Him. Probably at the fag end of Kuja Dasa, Krishna put to death His maternal uncle and tyrant Kamsa- As we have already said. Mars as lord of the 7th in association with Venus, lord of the 6th (enemies), in the 3rd (an upachaya) enabled Krishna to achieve victory over His greatest enemy and thus tide over the maraka period. His subsequent exploits in disposing off innumerable wicked kings, in saving the pious and the god-fearing from death and in trying to prevent the fatricidal war between the Kauravas and the Pandavas are a legion and students of astrology can study them in the light of the Lord’s horoscope. The most important event is His part in the Mahabharata war, which took place about 3138 B.C. when Ketu Dasa was in progress in the Lord’s horoscope. Ketu is in the 9th, the house of Saturn, whose results Ketu should give. Saturn is Yogakaraka and occupies the 7th having gained digbaia or directional strength. Krishna’s part in the Mahabharata war is well known. As charioteer to Arjuna, He remained a silent observer of the war, but directed “the movements to accomplish His final object of destroying the wicked and protecting the innocent”. Ketu is Mokshakaraka and he is in the 9th in the constellation of the Moon aspected by the martial planet Mars. And Saturn, as we have already seen, is immensely fortified. It was at the fag end of Ketu Dasa, that the immortal Bhagavadgita was taught by the Lord to Arjuna, on the battle-field, before the war commenced, when Arjuna, overcome by emotional weakness, shirked from his duty as a Kshatriya to fight for a just cause. In the remaining Dasas of Venus, the Sun and the Moon, Krishna passed a peaceful and happy life. With the dawn of Kuja Dasa again dissensions amongst Yadavas broke out. Finally Krishna shuffled off His mortal coil under the same directional influences. It will be seen that Mars as lord of the 7th is a definite maraka and he occupies the 3rd, a house of longevity, with Rahu. In the Navamsa again Mars is in the 2nd, a house of maraka. Consistent with the nature of Mars, Krishna departed by being hit by an arrow. When Krishna was sitting under an Aswatha tree in a forest, a fowler named Jara, thinking the foot of Krishna to be like the face of a deer, mistakenly shot his arrow. According to Bhagavata, the Lord departed to His own abode Vaikunta “in person”. Remarks — It is impossible for ordinary mortals to evaluate the personality of Sri Krishna — the Lord incarnate, statesman, counsellor, diplomat, philosopher, Yogeeswara, the expounder of the immortal Bhagavadgita, the destroyer of the wicked and the protector of the pious. All the three important factors in His horoscope, viz., the Lagna, the Sun and the Moon have been rendered strong. 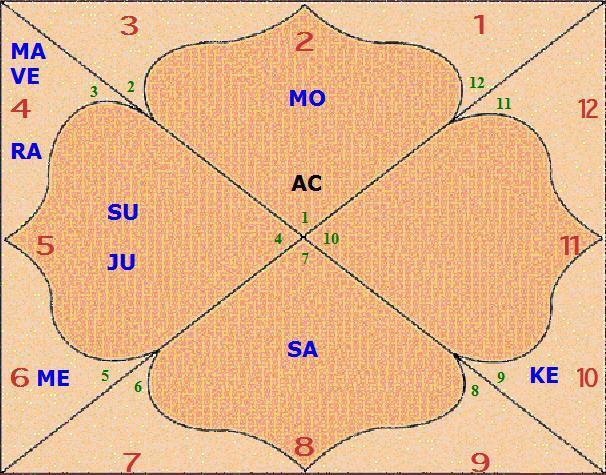 Atmakaraka Sun with the Gnanakaraka Jupiter aspecting the 10th or Karmasthana reveals an integrated and balanced personality. Yogakaraka Saturn is Vargottama and has digbala. His aspecting the Sun and Jupiter and his being placed in his own constellation are favourable factors rendering the nativity strong and sound. Since Saturn happens to be Ayush-karaka also, his strong disposition conferred a long life of 125 years. Mercury’s exaltation in a trikona—as lord of the 2nd (speech) in the 5th (intelligence) denotes wonderful and extraordinary intellect. It will be seen that Lagna lord Venus is with two malefics. This combination plus the kendra position of Jupiter and the Sun indicates perfection of all aspects of His personality. He was an ideal father and an ideal son, an ideal king, an ideal husband, an ideal statesman and an ideal teacher. He showed the way to do things, to do one’s duty, by being non-attached and He illustrated this in His own life. Whatever be the opinions of some of the modern scholars, there is no doubt that Sri Krishna was a historical reality. A mere literary creation cannot by any stretch of imagination move millions of human beings and bring solace to countless souls. The clue to His personality can be found in the manner the benefics and maiefics are disposed in His horoscope and the spheres of influences involved. The meaning of what He did can only progressively reveal itself to the generations that follow Him. The immortal Bhagavad-Gita, preached by the Lord, when Arjuna became uncertain as to his duty, has inspired and influenced the moral and spiritual thought and actions of innumerable persons and offered such persons solutions to their problems according to their own stage in evolution.